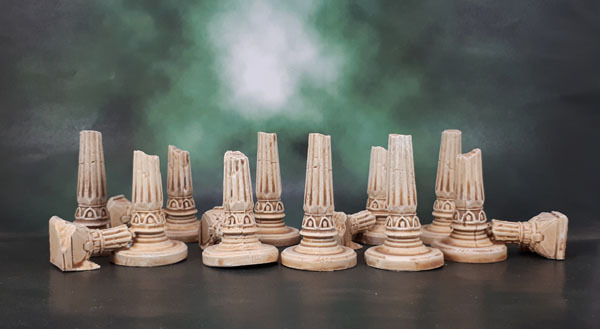 Mythic Battles: Pantheon – Ruined Pillars | Azazel's Bitz Box. I went for a slightly yellowed look rather than white marble based on some photos that image search turned up, along with the fact that they will mostly be used as outdoor ruins. Again, since they’re boardgame terrain I avoided really going to town with dirt, moss, vines and so forth as I might have in a diorama situation. Not quite as yellowed as the photo I’ve thrown up there, and I know the yellow/sandstone look can be a trick of the light – depending on where the photos are taken for the material they’re made of as well as the time of day – I’m going for a pretty generic emulation of that particular look, and the browns also provide the weathering. Since I don’t yet have any of the Mythic Battles figures painted yet, I took the showcase/size pic with a couple of Barbarians and a couple of Monolith’s Conan figures. This entry was posted in Board Games, Mythic Battles: Pantheon, Wargame Scenery and tagged Mythic Battles: Panthenon, Ruined Pillars. Bookmark the permalink. Simple maybe, effective definitely, but not unexciting! Colours and finish look absolutely spot on! Nice one! You can’t go wrong with some well painted columns. 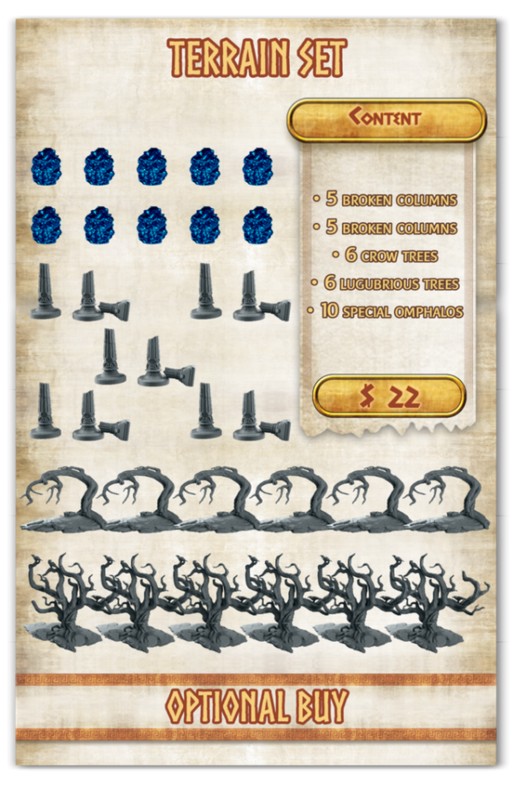 I imagine those might prove useful in your LotR game too? Funny, I got a free broken column mini in the mail from Miniatures Market. I haven’t based my Beholder yet, and was thinking ‘finish him for Jewel of July’ or ‘use the column and some base techniques you haven’t tried for August’! Challenges are so addicting. It’s like gamification of miniature painting. Anyways, really wish I could pull off the broken column on a miniatures base with the Beholder, but doesn’t look like it will align very well. More experimentation, for sure. Yeah, these sorts of terrain bits work very well as scatter terrain across a ton of different games and genres. Ancients through fantasy, through to 40k. Even WWII (Libyan Ruins come to mind). You could always try to make sure that the column is securely mounted to a (wide enough) base, then use a bit of wire to hold up the beholder. That’s probably what you were thinking about – but then when you go diorama base, you can always go larger with the base. 60mm should do it without enveloping the figure too much? Thanks mate! Yeah, the slightly cream/bone colour looks pretty good. I’ve got some other, unbroken ones I’ll be doing in mid-grey, and then some others again I’ll do in white/off-white. Noooo! If they are all this good i’ll be paralyzed by choice and indecision! Excellent mate – and super useful! Cheers Alex – more scatter for the scatter pile! Nice solid little bits of scatter terrain. I’d also note that one other factor in the colour of buildings like this is air quality. 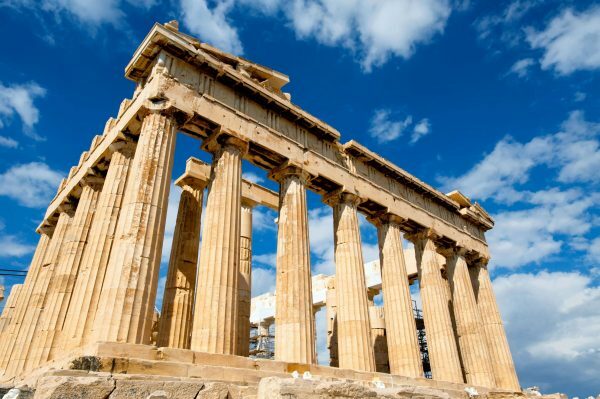 As I understand it, those Greek buildings stayed somewhat whiter before the Industrial Revolution. What really caught my eye here was those trees on the poster. Depending on how big they are, they could be really nice for my current Terrain project. That makes sense, though you’d expect them to be pretty mucky after some time being overgrown either way. Depends again on the material and where they are. The trees are pretty small. The proportional size on them compared to the pillars in the pic is about right. Nice and functional stuff. I need stuff like this. Yeah. I tend to forage through boxed games and accessories packs that I get in Kickstarters and this sort of stuff so often gets painted first. Nice man, very realistic. I’ve used cake toppers for mine but making them looked damaged didn’t really work. I like the yellowish. Thanks mate – can you get plaster cake toppers? They’d be perfect for dmaaging! Pingback: The Jewel of July – Personal Round-Up & July 2018 Painting Round-Up | Azazel's Bitz Box.